Nowadays, people looking for real Cherry MX switches might find themselves surprisingly short on options. Once the king of mechanical keyboards, genuine Cherry switches have become a rarity now that the design patent expired. So it’s been a bit of a relief for me to spend some time with the Cougar Attack X3 (currently available from Amazon for $73). If nothing else, at least it’s got my old faithful Cherry MX Blues under the hood. The Attack X3 is immediately identifiable, thanks to its hexagonal shape. Though not exactly groundbreaking in its design, Cougar has at least figured out a way to combine some pretty basic keyboard ideas—exposed metal backplate, black plastic chassis—in a unique way. It’s a nice-looking board, for the most part. The purist in me objects a bit to the way the sides stick out, since the bezel wastes valuable desk space just to come to a decorative point. That said, it’s mostly just an illusion, brought on by the Attack X3’s unconventional design. The X3’s bezel actually takes up less space than that of, say, the Razer BlackWidow X, which has squared-off, and thus less noticeable, edges. The typeface used for the keycaps also isn’t the most attractive—it’s a bit blocky and hard to read. But I like the way the metal meets plastic here (in contrast to the Aukey KM-G3 for instance) and for a “gaming keyboard” it doesn’t have an overly intrusive design. Also, the Attack X3’s gray aluminum backplate is a bit better than Corsair’s K70 or Razer’s BlackWidow X when it comes to hiding hair/dust/crumbs/whatever you drop on your keyboard. It doesn’t get gross as fast as the black metal on those other boards. My biggest issue is the lighting. 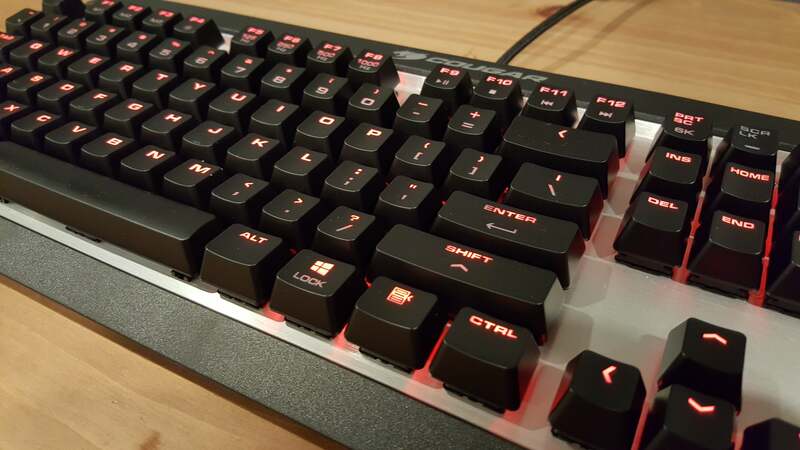 Cougar sent us the basic red-LED version of the Attack X3 instead of the more expensive RGB-equipped variant, but the problem would exist regardless. Since this a Cherry-equipped board, the LED on each key is set above the switch itself, towards where your monitor would be. The result is problematic, with the lighting brighter at the top of each key compared to the bottom. 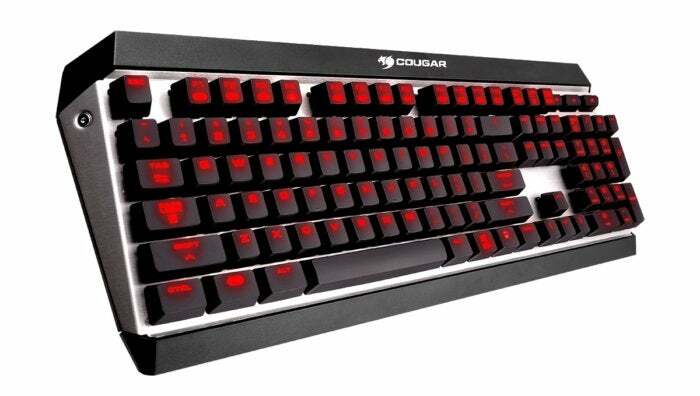 Now, Cougar isn’t the only vendor who uses this design—it’s also present on Corsair and G.Skill’s Cherry-equipped keyboards, as well as boards using knock-off Cherry switches from Razer and others. But it’s not universal. Logitech and SteelSeries switches, by contrast, eschew the traditional Cherry design and put an LED in the center of each key. Manufacturers typically compensate for an off-center LED placement by moving the text on each key to the top. Cougar’s done that, to an extent. You’ll notice the letters on each key aligned vertically with the top edge, for the most part. Rather than using stand-alone indicators for the Num Lock, Caps Lock, and Scroll Lock keys, Cougar decided to set them into the key itself. To do this, the designers put the LED for each of these keys at the bottom—but still just a single LED. This leaves three conspicuous dark spots on the Attack X3, with no lighting for the text on these keys. It looks weird and like a mistake. Also somewhat bizarre are the secondary functions Cougar included. F1 through F3 are labeled as macro keys, which is pretty normal, and F4 cycles through brightness settings. However, Cougar reserves F5 through F8 for on-the-fly polling-rate changes, allowing you to change the board to 125, 250, 500, and 1,000 hertz, respectively. And then Print Screen and Pause Break have secondary functions for six-key and N-key rollover. Some issues here: 1) These are typically set-and-forget settings. I can’t imagine swapping these often enough to need dedicated keys, or needing to make a change on-the-fly. 2) That goes doubly for “normal” users. Most people just need to set this to 1,000Hz and N-key rollover (which is probably the default anyway), and then ignore these settings forever. That gives you the fastest polling rate and means each of your keystrokes will be recognized. I could delve deeper into keyboard polling rate and rollover here, but there’s not really a reason to. For 99 percent of people, it will never come into play. These are the most minute of minute details, and unless you’re a specialist or a top e-sports player, you would never need to adjust these settings. So including them as on-the-fly options and dumping all that text on the board? Baffling. I do however love the Attack X3’s volume keys. Mute, Volume Down, and Volume Up each get a large, immediately accessible key in the top-right corner. This layout isn’t quite on par with Corsair’s standard volume roller, but it’s definitely better than needing a function-key combo to adjust volume. The Attack X3’s Cherry keys are the main draw though. As I said up top, finding keyboards with actual Cherry keys is much harder these days. As a longtime fan of Cherry MX Blues, it’s a relief to type on the genuine article instead of yet another knockoff. I’m not going to evangelize too much. Chances are if you care enough to read a mechanical-keyboard review, you also know your way around Cherry variants. If not, you can always check out our primer. Suffice it to say, Cherry Blues are still my favorite tactile keyboard switch. They’re a joy to type on, and work just fine for the gaming that I do. Sure, you can get a shorter actuation point with Razer’s Greens (a Blue knockoff) or Logitech’s Romer-G keys (a not-so-great linear switch) but neither of those is quite as good for day-to-day typing needs—which is presumably one's primary activity on a computer. I found myself a bit annoyed with the Attack X3 though, despite its Cherry internals. For some reason Cougar decided to widen keys on the bottom row of the Attack X3—most notably the left-hand Function key, which sits in the spot where the Windows key would normally go. As a result, the spacebar is approximately a centimeter shorter than usual, and shifted slightly to the right. It’s not a huge deal, but it did make a noticeable difference to me, especially while gaming. With my fingers on WASD, my thumb just barely rested on the left edge of the spacebar. Normally I’d find it sitting comfortably about a quarter of the way down its length. These sound like small issues, and they are. I just didn’t find the Attack X3 as comfortable for long-term use, nor was it as precise. And the only benefit is...a slightly bigger Function key? This design choice is very strange. 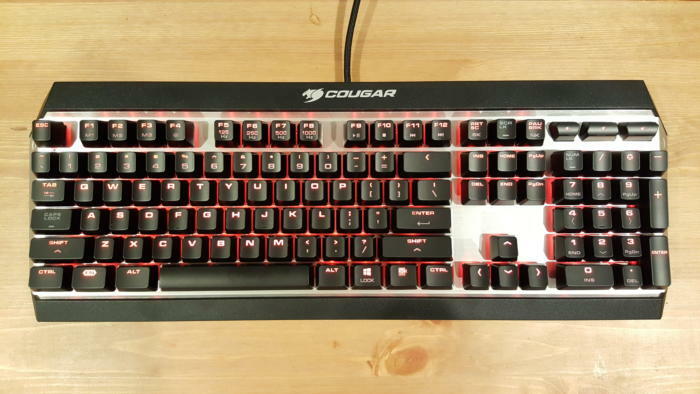 The Cougar Attack X3 is a fine entry-level keyboard, especially if you want real Cherry MX keys and a full-sized board at a fairly cheap price. Full-sized boards often start at $100-plus these days, especially ones with actual Cherry keys. That being said, some weird decisions hold it back from “Best of” status. 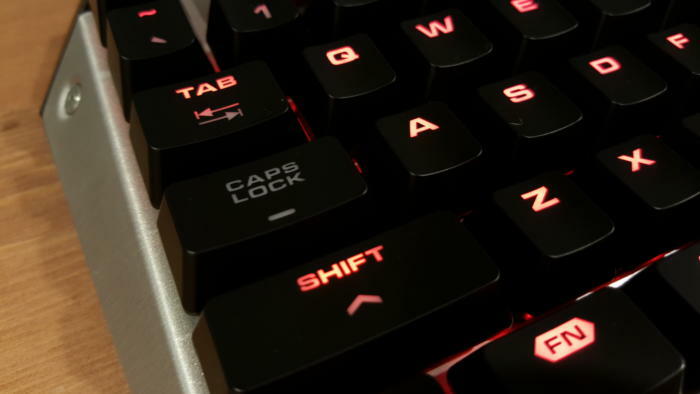 The lighting is neither as pretty nor functional as competing products, and the nonstandard layout of the bottom row is a needless misstep—one that affects gamers (Cougar’s target audience!) the most. The Attack X3 is a good keyboard, falling just shy of being great. The Cougar Attack X3 packs real Cherry MX switches and optional RGB lighting, but a nonstandard bottom row might make it a stretch (literally) for gamers.